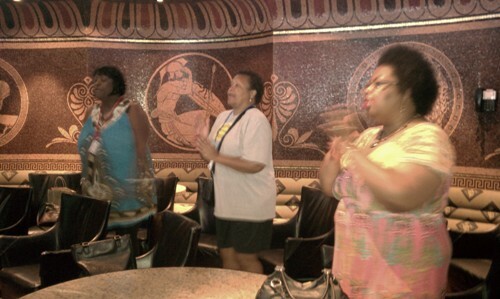 This is a blog series on the Women of Destiny conference, cruise to the Bahamas, which will continue through this week. Click here to read Part 5 – A Grateful Heart. 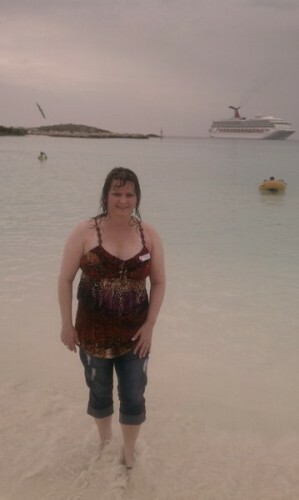 Half Moon Cay is a private island owned by Carnival Cruise Line, and it was our second port stop. 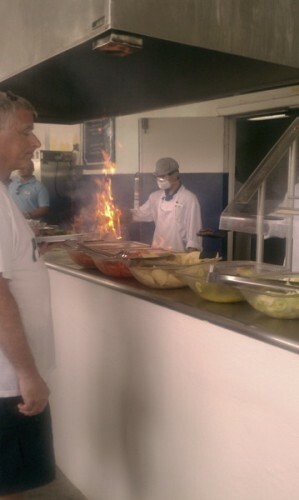 Carnival Destiny’s staff had planned an “island bbq” for us when we arrived. We accessed the island by going on a little boat to ride to the island about a mile away. When we arrived there, the feast was ready. Did you know God has a feast prepared for you? Will you come? The ocean here is also that exquisite blue-green, clear as glass, with soft white, shell-less sand on the beach. 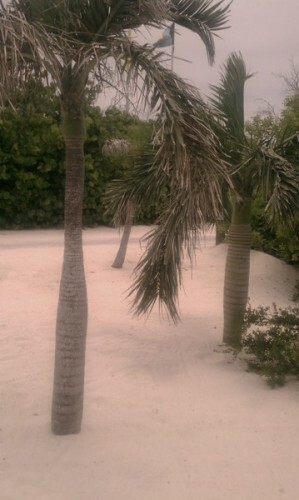 I saw more beautiful palm trees, and the yellow elder flowers which are the national flower of the Bahamas. Everyone was drawn immediately to the smell of the food. The staff had grilled cheeseburgers and hotdogs and grilled vegetables like zucchini and squash. 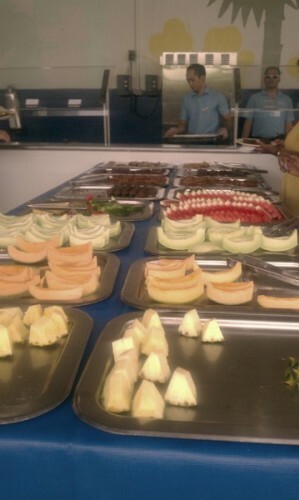 They had prepared cous-cous, salad, and fresh fruit of bananas, pineapple, watermelon, cantelope, and honeydew melon. The fresh pineapple and watermelon were delicious! 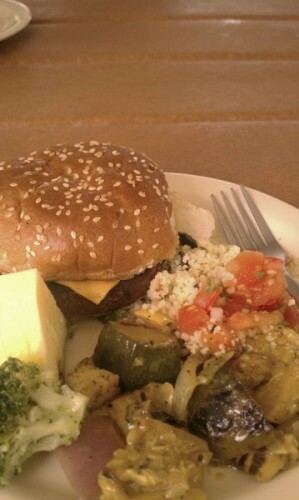 I also loved the grilled cheeseburger and grilled veggies, and the cous-cous. Cous-cous is the North African national dish. You can serve it with a meat or vegetable stew served over it, or just plain. At home, I often add diced onion and tomatoes to it, seasoning it with salt, cracked pepper, and sesame seeds. I liberally squeeze fresh lemon juice over it to add some tang. 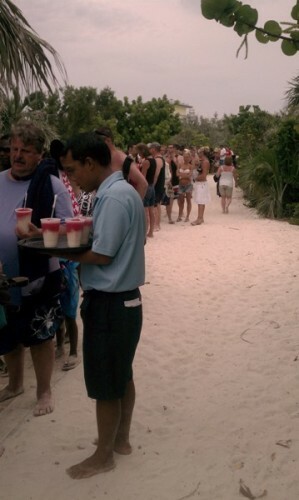 At Half Moon Cay, you can take a shuttle to go to the little souvenir stores. Click here to see the bumpy shuttle ride. At one of the shops, I saw a native woman whose fingernails had grown so long they were curled underneath her hand. She was proudly showing them off to tourists and letting them take pictures with her and her nails. One of my friend’s silly questions about her fingernails was, “How does she manage to go to the bathroom without it getting underneath her nails?” These are the type of questions that solve the mysteries of the universe. 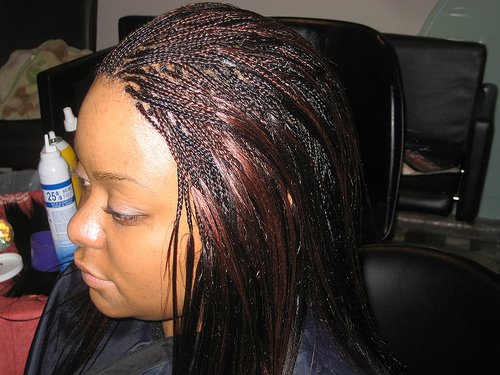 One popular service offered in the Bahamas was the native women braiding tourists’ long hair. I am married to a man who is obsessed with long hair. He would love it if I had Rapunzel-length hair. When I was about to enter middle school in 7th grade, my thick, brown hair had grown to reach the end of my back. My mom thought I should get “a cute, new style” for school since I was older now. She wouldn’t have to help me get all those painful tangles out every day, she said. It’d be a lot easier to manage, and much cooler. When I came out of the salon with a very short pixie cut, I knew this was a huge mistake. MY LIFE WAS RUINED! I stared into the mirror at the girl with the round nose, wire-frame glasses with coke-bottle-thick lens, and boy-short hair, and wanted to cry. When I came home and showed it to my dad who was outside in the back yard, practicing putting with golf balls, I thought HE was going to cry. “You cut it all off!” he accused my mother. A pained expression crossed his face that his beautiful baby girl had been disfigured like this. He was disgusted. I have encountered the same disgust from Ray whenever I get my hair cut shorter than shoulder-length. What IS it with men liking women with long hair? For years now I’ve been trying to grow it back out JUST FOR HIM. The longest part now reaches a little past my shoulder blades in back. Some feminists would scream in protest at this “machoism.” After all, it’s MY hair, right?! He isn’t the one who has to wash and condition it, dry it, or straighten it! He wears his hair in an easy military, crew top most of the time! I may never have Crystal Gayle’s ankle-length locks (nor would I want to! ), but at least for now my hair is longer than it was. 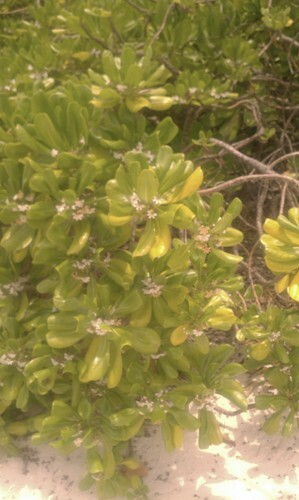 Since it is fairly long, many Bahaman women offered to braid it for me. I politely declined. Apparently this is a popular business in the Bahamas. The hair braiding businesses remind me of the story of the widow’s oil in 2 Kings 4. A woman’s husband had died and creditors were going to come take away her two sons as slaves. Elisha the prophet asked how he could help her and what did she have in her house? She said she had nothing in her house except a small jar of olive oil. Elisha told her to go to all her neighbors to borrow empty jars, and not to ask for just a few. Then shut the door behind her with her two sons and to begin pouring oil into the jars. She did this and all the jars filled miraculously with oil. She sold the olive oil and paid off the creditors, and she and her sons lived on what was left. The woman had faith in God’s word and used what was in her hands, and God caused increase and an overflow in her life. You can do this for your business, too! Use what you have in your hands. Stop holding back in fear, intimidation, and uncertainty. Be bold! Use your gifts for God’s glory! After the island bbq and I visited the souvenir shops, I went back to the beach. 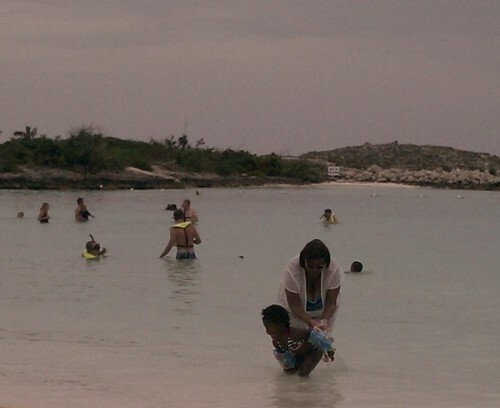 Click here to view a video of the beautiful, blue-green water and the beach with the soft, white sand at Half Moon Cay. Beach scenes take some of the most natural, beautiful pictures. 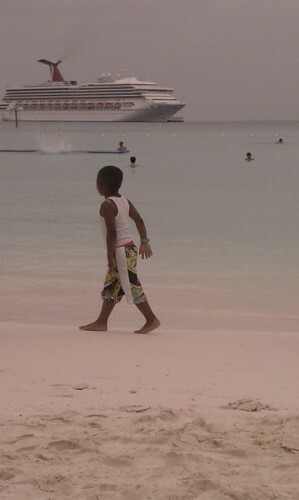 Below is a pic that I snapped of a little boy walking on the beach, with the blue-green ocean and the Carnival Destiny ship in the background. Here were some children building a sand castle – a must for the beach! What are you building your business/ministry on – the rock of Christ or some other unsteady foundation? You can enjoy a variety of excursions at each port, such as swimming with stingrays and dolphins, riding horses on the beach, parasailing, going to Atlantis, touring the land in shuttles, renting boats, kayaks, or scuba diving gear, etc. 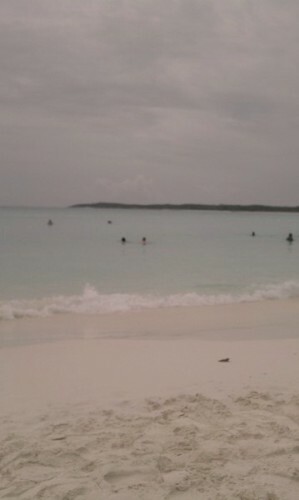 Below some people are snorkeling at Half Moon Cay. I also thought this little girl with her mom was so cute. I enjoyed watching her play in the water. It’s important even for us adults to set time aside each day to just play! What have you done lately to play and have fun? 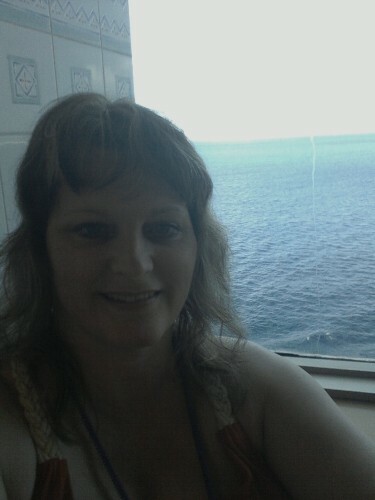 This week on the cruise to the Bahamas was incredibly fun! I desperately needed to get away to the beach for awhile from everything and everyone, to de-stress and relax. 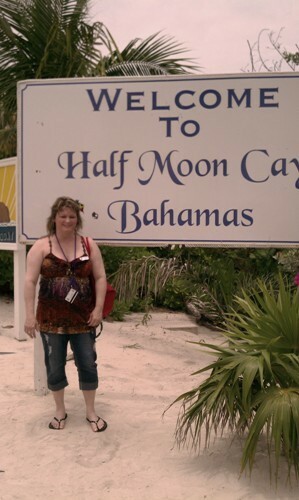 I swam at Half Moon Cay island. The temperature was much colder there than at Grand Turk. I had to slowly walk into the water. Below is a pic of me after I’d already swam and had changed back into my capris. My hair was still wet. I wanted at least one shot of me in front of the beautiful water on the beach! When it was time to go back to the ship, there was a LONG line of people. 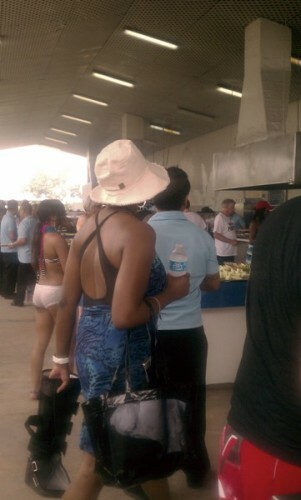 To entertain the passengers, a man walked around, trying to sell them colorful, expensive pina coladas. I was more interested (i.e., NOSY) in the people in front of me, speaking with a British accent. Two of them, a mother and her daughter, had come on the cruise together. The third person, a man, asked what part of England they were from. It intrigues me how God is the Divine Networker! When I arrived at Half Moon Cay, I was in a pensive mood. 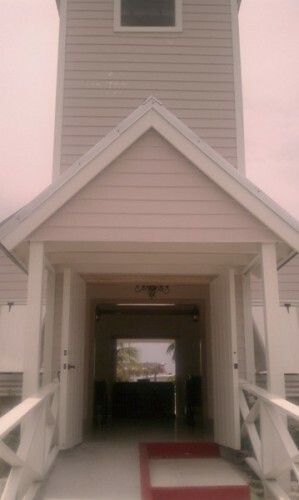 After I ate, I walked around the island, asking God why on earth He had sent me to the Bahamas! It was nothing I had sought out. Tony had sent me a message on Facebook, asking me to speak at her Women of Destiny conference. She and I had met on a Twitter party and had connected through a mutual friend on Facebook! I didn’t even want to go on a cruise; I was scared! And we certainly didn’t have the money for me to go. God had sovereignly provided for me financially to go on this trip, so He must have a purpose for it! What was my assignment and mission from God? Was I really being a carnal Christian, using being a speaker at the Women of Destiny conference just to go on a cruise and to indulge the flesh, eating my way through the Bahamas and getting out of any housework or cooking for my family for a whole week? What were my heart’s true motives? What was my assignment and mission from God here in the Bahamas?! Were demons flying all around me in the Bahamas and I was simply unaware of them and oblivious to what was going on in the Spirit? Should I be marching around Half Moon Cay like the army of Israel did around Jericho? Was I being lazy with my spiritual gifts? No, that wasn’t the case. Some of my strongest spiritual gifts are prophecy, discernment and intercessory prayer. I was sensing the same things as Tony was, but I know that wherever my foot treads, I take possession of the land through Christ. (Deuteronomy 11:24) God wanted my attention elsewhere than the warfare. Why was I here, God? I waited and listened. Then I heard His still, small voice. Even now tears fill my eyes as I remember what He said. That was it? That was IT, God?!! 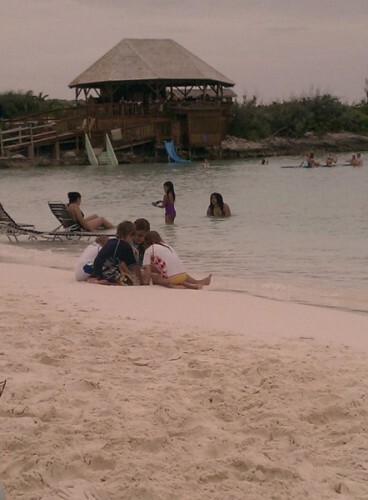 You sent me to the Bahamas just to pray? Well, partly. The other part was to speak God’s words of truth at Tony’s conference and to connect with Tony and her ministry team members, Angela and Kim, and with two specific women at the conference who sought me out one on one to share their hearts with me. I valued their trust and confidence in me, and knew it was a God thing. I had simply listened to and encouraged them, which is what people really need. The grip of the terrible? Great! That doesn’t sound too fun! Seriously, God had sent me to the Women of Destiny conference to be as His mouth – His messenger. Ray would probably jokingly say that he has no problem thinking of me as a Big Mouth! God had also sent me there to connect with the women and to pray over these lands. That God had specifically sent ME there for a Divine purpose to the Women of Destiny conference on this cruise to the Bahamas was confirmed the last day of the conference by one of the attendees. She publicly shared with Tony, me and everyone that she knew God had sent me there, to share the bold truth with my message. It specifically ministered to her. This greatly encouraged me. While at Grand Turk, Half Moon Cay, and throughout the rest of the trip, God led me to pray for His blessings, His glory, and His kingdom to come there. As my friend Ruth Christian shared with me the following Sunday afternoon at small group, God often sends in the intercessors to “prepare the land and the people’s hearts with prayer” before He sends in the missionaries and evangelists. You can read more about the importance of prayer prior to missions in E. M. Bounds’ article and in an excellent article by a missionary mom in Albuquerque, New Mexico on 10 Prayers For Missions or Mission Trips to know what to pray for evangelists or missionaries before they go there. In tomorrow’s Blog Series 7, I’ll write about our last port, Nassau, where I had a blast shopping. I tried to turn off my “business brain” while on this trip to the Bahamas, but it didn’t happen! I will share with you what God showed me about women in business. Have you been enjoying this blog series? Please leave your “aha’s” from the posts and your comments below.